Warwickshire PCC, Philip Seccombe (in the Yellow Jacket), pictured with the Rugby Street Pastors and Doorstaff. On Friday October 7th, Warwickshire Police and Crime Commissioner (PCC), Philip Seccombe TD, went out on patrol with the Rugby Street Pastors. This was preceded by a tour of the Rugby First CCTV Control Room. While on patrol, Mr Seccombe experienced first-hand the Rugby night time economy, including visiting night clubs and talking to the door staff and clubbers as he patrolled Rugby’s streets. 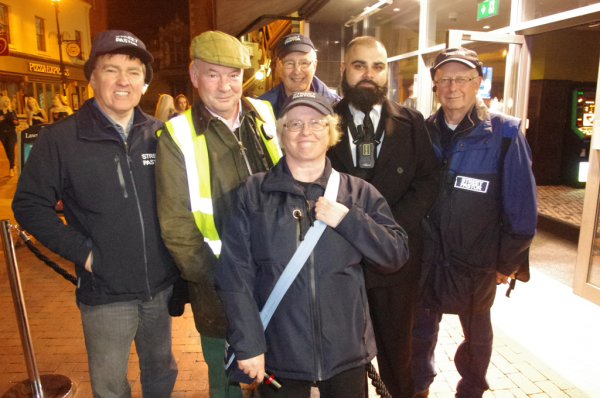 Mr. Seccombe said “I was pleased to be able to join the Street Pastors out on patrol in Rugby to see for myself how their presence in the town centre makes a real difference in helping to keep people safe. I was impressed by the professionalism shown by all of the volunteers and the caring attitude they embodied while out on patrol. “The street pastors provide a valuable service to members of the public who can find themselves in a vulnerable state while out enjoying the night-time economy. Their early intervention can mean that an individual, who might otherwise become a victim of crime or require police or medical assistance, is able to get home safely, helping to reduce crime and keep our communities safe.